Alia Bhatt has given a clarification on accusations of plagiarising Dua Lipa’s ad shoot. She said that her photos with Filmfare were shot before Dua shared hers. 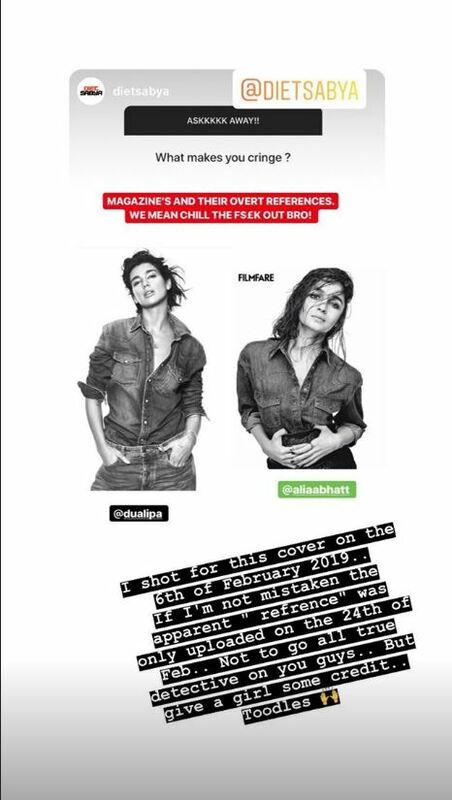 Alia Bhatt says her photoshoot for Filmfare was shot before Dua Lipa shared similar pictures on Instagram. Actor Alia Bhatt revealed her latest cover for Filmfare magazine with Kalank co-actor Varun Dhawan on Thursday. Soon after, Instagram account Diet Sabya accused the magazine of copying the photoshoot’s idea from singer Dua Lipa’s ad shoot with Pepe Jeans. Alia has now given a clarification about the same. Alia took to Instagram to tell her fans that she shot for the magazine before Dua shared the pictures online. “I shot for this cover on the 6th of February 2019. If I am not mistaken, the apparent reference was only uploaded on the 24th of Feb. Not to go all True Detective on you guys but give a girl some credit. Toodles,” she wrote with a photo collage of the two pictures, shared by Diet Sabya on Thursday. The pictures are black and white and show Alia dressed in an all denim outfit. Dua’s pictures also follow the same aesthetic. Sharing the magazine cover on Instagram, Alia wrote on Thursday, “I desire therefore I exist.” The pictures show Alia and Varun in all black outfits. Alia shared some glimpses from the title track on her Instagram account on Thursday afternoon, featuring the lead cast, which definitely raised the excitement of fans. Earlier the makers released Ghar More Pardesiya and First Class. Varun’s latest dance number from the film, First Class as well as Alia’s classical moves in the song Ghar More Pardesiya have already received an overwhelming response from the viewers.